Will Mini stores move in with BMW? Retailers have opened 127 free-standing Mini stores since 2008 at the factory's request. Sluggish sales for Mini — BMW's bold 16-year-old venture to entice Americans into stylish British small cars — have become a crisis. To overcome Mini's meager product pipeline and stem dealer losses, BMW of North America confirms it is considering letting Mini dealers move operations into their BMW stores. A decision has not been made, but the change would end Mini's insistence on a separate high-profile identity. It might also be a milestone in the struggling brand's saga. The marque, which expected annual sales of 100,000 cars by 2017, peaked at about 66,500 in 2013. Through the first 10 months of this year, sales totaled just 37,359. That is hardly enough to support the investments of retailers who opened 127 free-standing Mini stores since 2008 at the factory's request. "As a dealer and a manufacturer you have a vision of where the brand is going, and you have to prepare for it," Jason Willis, a member of the Mini National Dealer Council, told Automotive News. "In this case, the vision now isn't what it was when some of these stores were built." A standalone dealership model for a small-car brand today is financially untenable, said Rebecca Lindland, executive analyst with Kelley Blue Book. "There's very little on the horizon to suggest the return of the small car," Lindland said. "I would hate to see the dealership model be the death of Mini." Mini's struggle takes place as U.S. consumers shun cars for light trucks. The brand's U.S. sales in 2017 tumbled nearly 10 percent. The last year Mini had a U.S. sales increase was 2015, when deliveries rose 4.3 percent. "You've got a small product line — all small cars — in a strong SUV market," said Willis, general manager of fixed operations at Willis Auto Campus in Des Moines, Iowa. "Our product doesn't match the demand." The profit pressure is evident. Mini went from 45 percent (56 of 124) of its dealerships being unprofitable in 2016 to 54 percent (69 of 127) of its stores losing money last year, Automotive News reported in March. BMW said it is considering ways to shore up the Mini business. "We want to focus on dealer profitability so that they are properly represented in the marketplace," Thomas Felbermair, vice president of Mini Region Americas, told Automotive News in an e-mail. Mini said it wants to help its dealers find ways to lower overhead and improve operating efficiency. The brand is working to accommodate dealer requests to integrate Mini operations into BMW stores, while ensuring brand differentiation. To do this, Mini is looking at separate Mini-branded showrooms with dedicated sales and service employees. 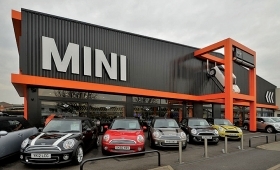 Mini also is working with some dealers seeking to downsize their retail locations. In additions, the company is working to reduce requirements for the number of showroom vehicles and showroom space. "We've given a lot of flexibility for the dealers to present ideas," Felbermair said. "This is to help make sure that, until our next wave of product, and the market becomes more favorable, our dealers each remain a strong and going concern." What BMW is considering has a precedent. In 2016, FCA US hatched a plan to bolster its struggling Fiat dealers in the U.S., in part by letting them combine operations with adjacent Chrysler-Jeep-Dodge-Ram stores. Selling Minis at BMW stores is an opportunity for cost-saving and won't ding the BMW brand, Lindland said, because Mini vehicles are still seen as premium. But reintegration will be complex and likely require an amendment to the dealer agreement. And it will not work for some dealers. The brand has 31 retailers who are not also BMW dealers. Willis' Des Moines store is one of them. "We are looking at additional forms of support for stores that remain fully exclusive," a Mini spokesman said. Willis said, "Whether it's used cars or service, or some other automotive-related activities, we'll find a way to make the buildings work. The overhead isn't going away, so we're just going to have to find a way to bring that income in, one way or another." Mini dealers have expressed frustration with the lack of new product. Mini launched the redesigned Countryman, its largest vehicle, in spring 2017. A plug-in hybrid variant went on sale later that year. Looking ahead, a full-electric Mini is expected next year. "There's no new products on the horizon that give dealers the warm feeling that things could turn around for our current standalone business model," said Michael Vadasz, former chairman of the Mini dealer council. Mini acknowledged dealer frustration with the lull in the product cycle. "We're in a development phase," Felbermair said. "There's a number of longer range projects that you will see come to fruition." Mini dealers said their buildings are too large for today's market. "It's not sustainable," said Vadasz, general manager at Otto's Mini in Exton, Pa. "We can't afford to be in these big buildings." But Mini dealers may need more than shedding their oversized stores. Some dealers blame the brand's situation on a lack of consumer awareness. One dealer, who asked not to be named, said the automaker has for years lacked the funds to properly market its cars, and has failed to target the right customer segment. The brand was launched with an expectation of capturing the American youth market. But that didn't happen. The dealer said, "About 65 percent of my customers are over the age of 40."